Today, as we were listening to the sermon at church, my 6-year-old son heard the speaker say the word “sin.” I whispered in his ear and asked him if he knew what sin was. Now we’ve had many discussions about the basics of the gospel, including sin, but I wanted to hear his thoughts on the matter. His reply was enlightening. “Sin breaks us,” he replied back, eyes looking up to make sure he got the “right” answer. “You got it, kid,” I whispered back. Sin breaks us, Jesus changes us. Sin died, but Jesus lives. Six-year-old theology says simply what countless sermons, books, podcasts, blog posts, and seminarians struggle to communicate—all condensed into six words. I’ve read a lot of commentaries on what exactly Jesus meant when he said unless we change and become like children, we wouldn’t enter the kingdom of heaven (Matthew 18:2). The more I work with children…wait, let me rephrase that…the more I listen to children, the more I think Jesus wanted us to grasp the kingdom, simply, like perhaps even, “six words” simply. Sometimes, since we are adults, we take our role of as parent, protector, discipler, mentor, and teacher seriously, so seriously that we may forget that we are also called to listen; to change and become like children. In their book, Listening to Children on the Spiritual Journey, Drs. Catherine Stonehouse and Scottie May share, “If we see children through the eyes of Jesus, we will realize that they are models of faith and sources of revelation…As we live and minister with children, we want to be alert to what God desires to reveal to us through them” (p. 18). How can we be intentional about doing just that? Here are some ways we can hit “pause” on the ministering-parenting part of being adults and tune into that listening-learning part of being Christ followers. Ask questions – That was all it took this morning. I knew he’d heard lots of stories before so I just asked him about it. The response was how he had heard and understood those stories. And I learned. Let them tell you the bedtime story – If you have a book with pictures, often those give enough of a clue for the story to get started. I love hearing the stories as told by children. In my experience, they talk a lot about the love of God and the hope found in the stories. Don’t assume, ask – One time, a child walked up to me and handed me a picture with a bunch of random dots on it. I thanked him, but then was prompted to ask, “Tell me about this picture.” He went on to explain that the one green dot on the paper, which was in the middle, was God. The red dots were his family. The blue and yellow dots were all the people of the world. God was in the middle so He could see everyone and take care of all of them. I learned a valuable lesson that day; don’t assume – ask. Listen – Simply listen to them. Lie in the grass looking at the sky and listen to them talk. Sit beside them on a bench and listen to them dream. Hold their hand as you walk and listen to their stories. Let their awe and wonder over bugs and rocks and clouds and snowflakes draw you back in to the awe and wonder of the Creator. 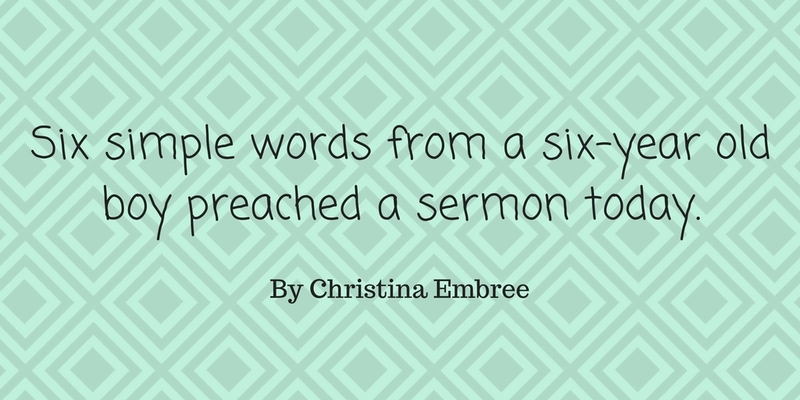 Six simple words from a six-year old boy preached a sermon today. I’m grateful I was listening.